Webometrics is ranking the World universities according their presence on the Web. In the new announced ranking of the world universities by Webometrics on July 31st 2016 Koya University has been ranked as the top university in Kurdistan Region. This great achievement comes after years of dedicating academic community that embraced a pioneering strategic planning of a student centred e-Smart university. This has led to a better valued academic visibility with a global perspective in mind. The road map has been layout in a 10 years strategic planning starting early 2012 and the results are revealing greater success in the horizon. On the foothill of the Béjhar mountain lay the green campus of Koya University in the city of Koya, which is 1.0 hr drive to the East of the regional capital Erbil (Arbil, Hewlér) in Kurdistan Region in. Iraq. Its campus has been carefully laid out to embrace the beautiful high mountainous nature. The Koya University was established in 2003 and has developed noticeably since then. In 2010, following reforms in Higher Education Koya University was restructured from colleges to faculty systems to enhance the interactions between similar academic fields. Today the University has 4 faculties -Engineering, Sciences and Health, Humanities and Social Sciences, Education and a newly established School of Medicine. The university consist of 23 departments in different fields, such as Petroleum Engineering, Geotechnical Engineering, Clinical Psychology, Social Science and Medical Microbiology as well as Sport Education. In early 2012 office of Vice President for Scientific affairs introduced a long term strategy for creating an e-Smart all inclusive interactive university (see figure 1) with global impacts. The strategy included the process a firm electronic foundation that has been laid for running Koya University's inclusive communication which is e-enabling all members of its academic community. The created system allowed academic members to experience self-promotion with unique academic values with visible footprint. Koya University have developed and applied what needed for an advanced self-promoting academic portfolio and Continuous Academic Development (CAD) and helped all member to understand and adapt such a strategy. This pioneering strategy put students quality and success at the core of all vision, mission and values of the University. This means teachers can use the system as a means to enhance their academic presence or visibility and also to strengthen their academic relations with their students as well as creating academic footprint with global impact. However, Dr Haidar Lashkari the Vice President for scientific affairs (Feb 2016 - current) says that our academic community’s attitude towards the future of the university has changed and these recorded success has boost the sense of belonging among our staff. 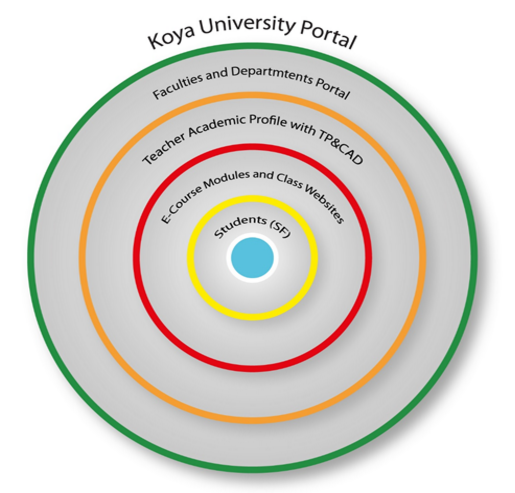 Koya university pioneered in linking the TQA measures with all stages of its new strategy for a e-Smart university to mark a paperless smart academic community as well as creating measurable successful academic self-promotion. Koya University put forward a plan to make the TQA process an integrated part of academic life. Since 2012, the Directorate of QA at Koya University started an ambitious TQA process or easy scalable self maintained monitoring system for maximum visibility with zero administrative cost. Dr Salah I Yahya the director of QA at Koya University states “the sustainable paperless online system (SPOS) aimed to assure a quality teaching/learning at Koya University and support its wide inclusive strategy.” More information about this system can be found in the published paper in Volume 3, No 1, ARO Journal . However; The Koya University ranking has been measured in several Webometrics Ranking reports and the latest National University Ranking (NUR) which all give us a positive indication of the level of success of the Koya University. When it comes to a viable virtual presence Koya University Ranked as the best University in Iraq globally and that is what the e-Smart strategy stand for. The world universities are ranked in different classes namely, the Top 100, Top 500, Top 1000, Top 2000 and 2000+ globally. 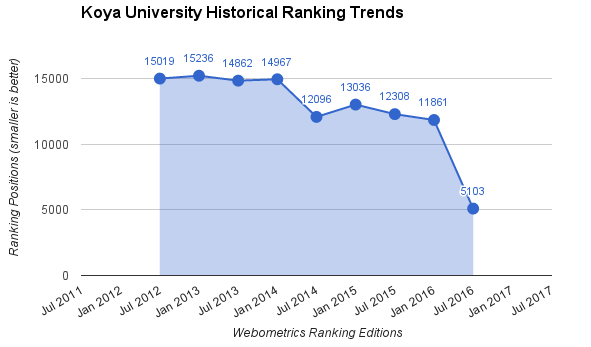 Let us understand the concept of “Ranking Web” and its value to universities ranked in 2000+ universities of the world by Webometrics. All Iraqi universities are included in this category and they are “Ranking Web” only. Koya University’s ambition is to be ranking among Top 2000 universities in next two years. Although Koya University can be classified as a young and small small university with few hundreds of teaching staff and 4000+ of students, with limited resources and support, pioneering in adopting and implementing an e-Smart strategy has put the university in the position to be able to represent the academic success in the Kurdistan region and Iraq. The lessons taking from a public university such as Koya University’s success in a turbulent region with unstable financial situation can be followed by other universities. Koya University has already encouraged other universities in the region and showed a great interest for institutional collaboration and knowledge transfer. CSIC is among the first basic research organizations in Europe. The CSIC consisted in 2006 of 126 centers and institutes distributed throughout Spain. CSIC is attached to the Ministry of Education and its main objective is to promote scientific research as to improve the progress of the scientific and technological level of the country which will contribute to increase the welfare of the citizens. CSIC also plays an important role in the formation of new researchers and technicians in the different aspects of the science and the technology, and credit the value of the adamic presence to the universities in a transparent impartial regional and global ranking system. Now it is going to be named Transparency and it will use the data from the Google Scholar Citations institutional profiles (Raw data is available from Transparent Ranking published in this same portal). Only institutional profiles are chosen. If your university or your faculty members are not included, please promote they set up (voluntarily) their own Google Scholar Citations public profiles with a normalized (official) name of the university in the affiliation and using the INSTITUTIONAL email address. If there is no institutional profile for your university yet, you should contact directly with Google Scholar. Weight: 10%. We use the maximum indicator value obtained from two independent inlinks information providers (ahrefs & Majestic). For improving reliability we exclude the 20 top linking domains and their corresponding backlinks from the calculation. Weight: 50%. Webometrics can be a good and reliable source for all universities in Kurdistan Region to measure their global impact and scientific presence. Nevertheless, academic will be able to promote their universities with measurable self-promotion of academic achievements and activities posted to their Teacher Academic Portfolio (TAP) which is accessible to global audience. We encurage our academic community to have an active Google Scholar Accoun (GSA) by using their koya university email account as well a global academic ID via ORCID.org which has become a globla standard for recognising the academic world wide. The Ministry of Higher Education (MHE) of KRG advised to use the Webometrics ranking to create a healthy academic competition. The academic footprint of individual academics can be used to real value of academic viability with scientific impact. The active TAP can provide immense value for visible academic promotion process at the regional universities. Nevertheless, the MHE uses the "Presence Rank" of the Webometrics for the National University Ranking in Kurdistan Region (NUR) as its criteria to rank the Kurdistan Universities. The QS Ranking is a commercial survey based inclusion of the universities which means individual universities fill a forms and provide their data to be included in QS database. The aim of such a system is marketing for attracting new students to evaluate their targeting universities before they enrol. Among 69 universities of Iraq only 11 of them are included in QS Ranking of 2016, therefore there are no clear argument for comparison how the Iraqi nationwide universities would performed in a complete listing by QS ranked system.